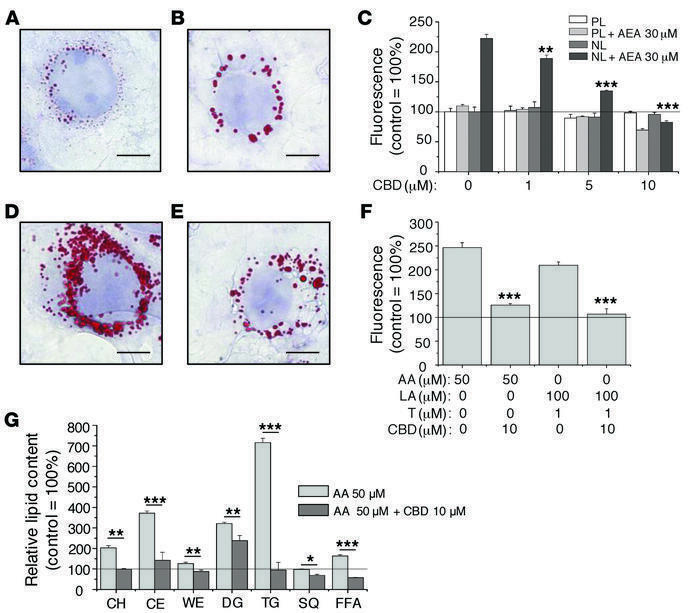 CBD prevents excessive lipogenesis induced by “pro-acne agents” in human SZ95 sebocytes. (A, B, D, and E) Semiquantitative determination of lipid synthesis for (A) control, (B) 10 μM CBD, (D) 30 μM AEA, and (E) 30 μM AEA plus 10 μM CBD (sebum droplets: Oil Red O staining, red; nuclei: hematoxylin, blue). Scale bars: 10 μm. (C) Quantitative determination of lipid synthesis (Nile Red staining). **P < 0.01, ***P < 0.001 compared with the AEA-treated group. PL, polar lipids; NL, neutral lipids. (F) Neutral lipid synthesis (Nile Red staining). ***P < 0.001 compared with the respective AA- or LA-T–treated group. (C and F) Data are expressed as the percentage of the vehicle control (mean ± SEM of 4 independent determinations). The solid line indicates 100%. Two additional experiments yielded similar results. (G) Analysis of the sebaceous lipidome. Sebaceous lipid classes were analyzed by HPLC-ToF/MS in sebocytes. CH, free cholesterol; CE, cholesteryl esters; WE, wax esters; DG, diacylglycerols; TG, triacylglycerols; SQ, squalene; FFA, free fatty acids. Results are expressed as the percentage of the vehicle control (mean ± SD of 3 independent determinations). The solid line indicates 100%. Two additional experiments yielded similar results. *P < 0.05, **P < 0.01, ***P < 0.001.